A representational still life which also manages to exploit form and pattern in an almost abstract way, this painting is notable for its exquisite harmonies of autumnal colour. Paintings by Holland rarely emerge onto the market, and this is a particularly attractive work, as unlike, for example, to Speedway (1930s), his homage to Gino Severini and the Futurists’ portrayal of machinery and movement, as is possible. It is also unlike his drawings, which conjure form out of a nest of curling lines. Dudley Holland (1915-56) was educated at Willesden School of Art, London. Whilst a student there in 1934 he painted two murals (‘The Three Musketeers’ and ‘Alice Through the Looking Glass’) in the children’s section of the Kensal Rise Library, which still survive although no longer in position. In 1936 he was awarded a scholarship to the Royal College of Art, but turned it down in order to develop in his own way. He taught at both Willesden and Harrow Schools of Art, and at Goldsmiths, University of London. In 1949 he became principal of York School of Art and Design, and in 1951 of the Guildford School of Art (now the Surrey Institute of Art and Design). As well as paintings and murals, he also produced prints; he exhibited at the Royal Academy from 1937, as well as the New English Art club, the London Group and the Redfern Gallery, and in 1950 shared a two-man exhibition at York City Art Gallery. 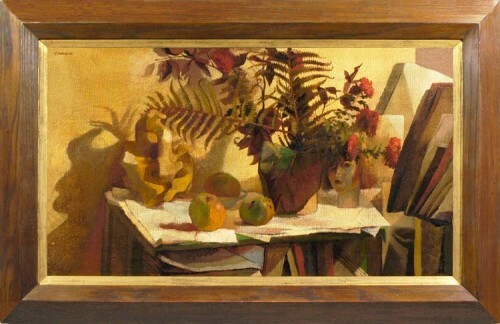 Works in public collections include Art gallery: transition (York City Art Gallery); Still life design (Manchester Art Gallery).